The heavy-duty RP-20HD delivers up to 40,000 lbs. of pressure to satisfy all your pressing needs. Two-stage pump action delivers incredible control, power and accuracy for a reliable press in commercial settings. This robust 20-ton press was designed for heavy use in repair shops but works just as well in your garage. Ideal for the removal and installation of gears, bushings and bearings, the RP-20HD also excels at bending, straightening and flattening. The applications are truly endless. 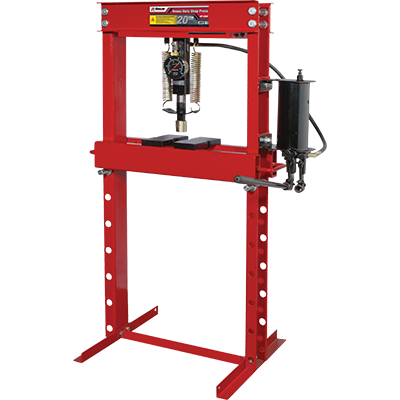 This heavy-duty hydraulic shop press features an independent two-stage hydraulic pump that provides incredible performance for the most rigorous pressing applications you can throw at it. Here are just some of the features exclusive to the RP-20HD Shop Press: a lateral moving cylinder, an integrated 4" diameter 20-ton pressure gauge, an independent two-speed hydraulic pump—all this on a rugged, heavy steel H-frame for extended durability. Two heavy-duty arbor plates included! Ideal for pressing bearings, U-joints, etc.